GE announces the latest, powerful Generator Circuit Breaker (GCB) with SF6 interrupting technology to its comprehensive portfolio. Based on more than 40 years experience in providing generator circuits breakers, GE introduces the FKGA8 with well recognized and advanced architecture suitable for large power plants from 700 MW to 2,000 megawatts (MW). Located between generators and transformers, GCBs are protection devices that quickly and reliably break fault currents preventing severe damages on equipment or potential, costly plant outages. 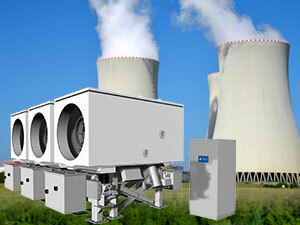 GE's FKGA8 GCB is the ideal solution for large nuclear, coal or hydro power plants. In addition, its compact footprint of the single-phase design makes it highly suitable for retrofits or replacements of old GCBs or load break switch with air-blast technology providing low cost lifecycle with maximum availability and reliability. The FKGA8 GCB is equipped with a highly reliable spring-spring-operated mechanism per pole. The FKGA8 is the first GCB in this range with breaking tests fully compliant with latest IEC/IEEE 62271-37-013 standards, with performances including: 250 kA short-circuit breaking current, 30,000 A nominal current with natural cooling and above 50 kA with IPB nominal current with integrated phase busbar (IPB) forced air cooling. With the latest FKGA8 GCB, GE confirms its leading position in designing and manufacturing GCBs with 3,000+ installations globally.